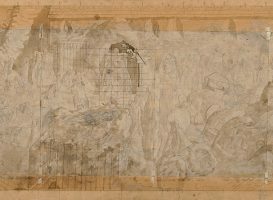 Stanley Spencer (1891 – 1959), Study for the Resurrection, Cookham, 1922, pencil & wash on six sheets of paper laid down together on card, 31.3 x 63.3 cm, acquired 1966. © The Estate of Stanley Spencer. All Rights Reserved 2016/ Bridgeman Images.